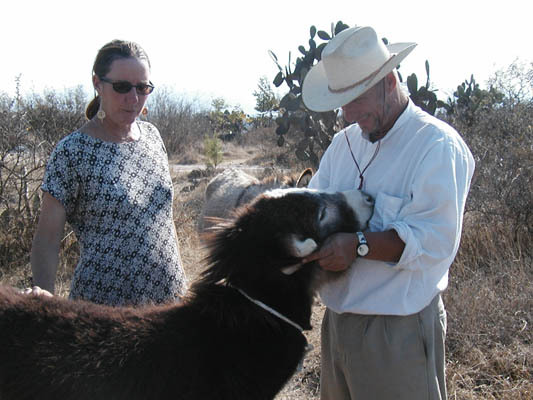 When we recently passed through San Miguel de Allende in Mexico, we wanted to connect with Andy Watson and Dorothy Gerhart, who run Karacadir, a sustainable development learning center. We first met them a couple of years ago when we were in the area, and were impressed with their dedication and vision for establishing this center. They have continued to pursue this vision, and today have established much firmer roots on the large tract of land that they have purchased. 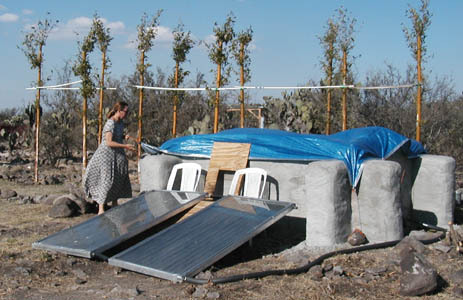 They have planted many trees, created a covered outdoor kitchen, set up their black wool nomad's tent, built several small earthbag structures as as training exercises, designed and built a solar-heated hot tub, established a working humanure composting system, set up a pop bottle, solar UV/heat treatment system to purify their water, and now have two donkeys to provide manure for their organic garden. Much of the work in creating these facilities has been provided by both workshop attendees and "Wwoofers" (Willing workers on organic farms", who come to spend a few weeks working in exchange for room (tent) and board. 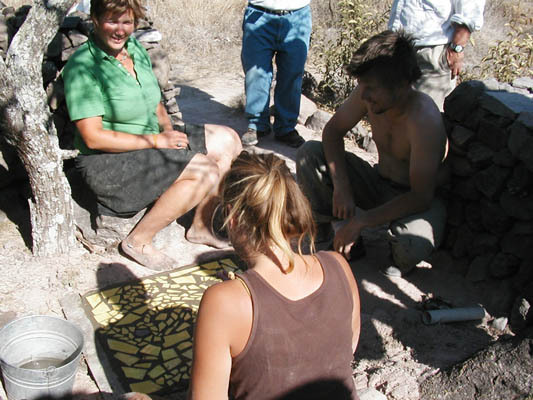 I met some of these folks, who were happily creating a small base for the compost toilet, using shards of tile imbedded in cement. Dorothy and Andy also showed me a house that they had been advising the owners about how to go about building with earthbags. 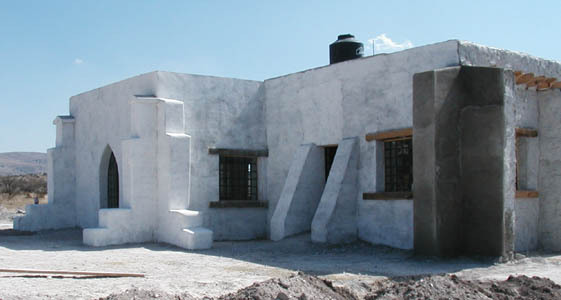 The building was nearly complete, and beautiful with much of the final plaster having been applied. 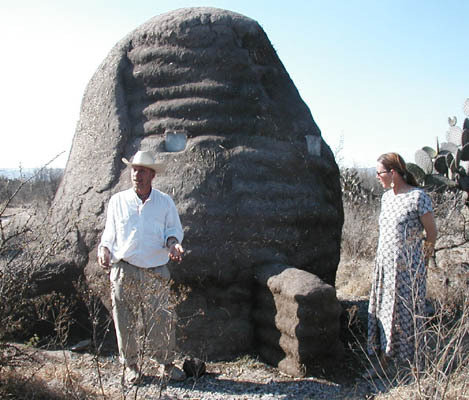 The earthbags they used were quite large (about 2 feet wide when filled), so the feeling of the structure was rather massive. Such thick walls tend to make for very comfortable living in this fairly moderate climate. The bags were filled with a local soil often used as a road base, which they moistened slightly before filling the bags, and then tamped into a rather solid material. The owners are delighted with the results of this project. Over all, I was pleased to see the progress of their dreams at Karacadir, and the extent that they have been accepted by the local community, both personally and institutionally. The work that they are doing will make significant differences in skills that people will bring to their own projects and in the attitude that folks that come in contact with them have toward sustainable development. For more information about Karacadir or to sign up for their many workshops, visit www.karacadir.com. I had an opportunity to speak with Manuel Sanchez Martinez, who is trained as an architect, but now mainly coordinates various University of Guanajuato programs related to restoration and new urban design, not just in this city but several others. I showed him pictures of our earthbag/papercrete house and explained some about why I had built it this way. He was quite interested in the concept. I wanted to find out how the typical buildings in Mexico work with the climate, and if there is much awareness of ecological considerations or tempering buildings with the climate in mind. Basically he said that people just build the same way, without any real regard for where the sun shines or other factors. Mainly people are interested in what views are available, and want to make sure that there is adequate ventilation, especially in the summer. Nobody heats or air conditions their homes; they just put on more layers of clothing if it gets cold, and open up the windows if it gets hot. There is very little use of insulation, and the walls are not nearly as thick as they used to be, so the heat and the cold is transmitted almost immediately. He said in the old days people built with thick walls and made very high ceilings, but that practice is dying out. Also, nobody builds with adobe any more…the preference is for more modern concrete. Earth-sheltered concepts are not prevalent either. We agreed that there is much education toward more ecological building that could be done in Mexico. He invited me to speak to one of his classes. His real love is for urban design, especially incorporating historic buildings into the plan. He does not feel that all of the tunneling to route traffic around Guanajuato is particularly productive, in that it just tends to encourage more people to use cars, which creates more traffic, congestion, and the need for more parking. He says that he has a car parked at the University, but he only tends to use it about once a month, since he is able to walk to work and to shop. Walking home I realized that I could possibly talk to Manuel’s class using the Power Point presentation that I had created for the energy conference in San Antonio; this would greatly enhance my limited ability to communicate in Spanish. So I emailed him about this and waited for a reply. Manuel had gone off to another city for awhile and I got no response. As our time in Guanajuato was drawing to a close, it was looking like this presentation was not going to happen. Then we encountered Manuel out watering plants in the back of a vacant lot that he owns when we happened to be walking down a path in the city. We greeted each other, and he said that the opportunities for me to speak to his class were limited, but that we could try for the next Tuesday morning. We were planning to leave the next day, so I said that this would work. I met Manuel in the lobby of the Engineering and Architecture Department of the University at the appointed time, and he took me directly to a beautiful little theater that had been carved out of an old cistern in the basement. The projector and computer were all set up and we popped in the CD to make sure it was all functional. Then he took me up to his personal office and I peered out the window into the active courtyard while he composed a “letter” on his computer. He later presented this letter to me after my presentation, as a document of their appreciation for my efforts. This first year urban architecture class consisted of about 33 students (at least half of them were women). They all politely listened to Manuel’s introduction to me, and then I proceeded to massacre the Spanish language to a very tolerant audience, who would occasionally volunteer assistance when I was groping for a word. I would frequently look to Manuel for help, since his English is pretty good (he married a woman from the United States). The presentation actually went quite well, with most of the class in rapt attention. Having over 160 slides to go through made it all much more informative than it would otherwise have been. After the last slide, the class was given a chance to ask questions, so I answered several about the nature of papercrete and earthbag construction (which they had never heard of) as well as more traditional materials, like adobe. One fellow wanted to know how you could keep adobe from disintegrating, obviously believing that adobe was inferior to brick or concrete in this regard. Both Manuel and I assured him that with adequate roof protection, adobe can last for centuries. At the end, there was enthusiastic applause, and I felt that my effort was well worth the trouble. I am sure that most of the class became somewhat more aware of the ecological issues that motivate the natural building movement. 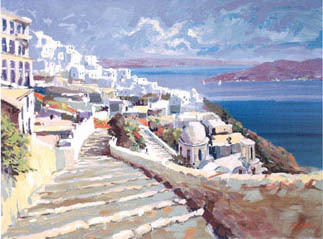 I have just spent an enjoyable several days pouring over the thousands of posters and art prints available at allposters.com to post the most pertinent and beauftiful ones for your viewing pleasure at www.greenhomebuilding.com. Not only can this lovely art grace the walls of your home, but you can study the architecural styles presented for ideas and inspiration. For instance, the ornate majesty and elegance of urban French architecture contrasts with the simpler country forms and together they suggest the sumptuous richness of France. Classical Greek architecture has endured both in the mind and in reality for centuries. These elegant forms can bring a classical touch to your home. 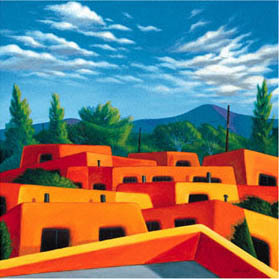 There is a distinctive mood and flavor to Southwest American art that reflects bright sunshine on cool adobe walls, with a peacefulness and relaxation that is hard to come by these days. These lovely artistic posters can bring this peaceful relaxation into your home. Altogether I have posted a dozen pages displaying the vernacular architecture of much of Europe, India, Egypt, Asia, and North America. 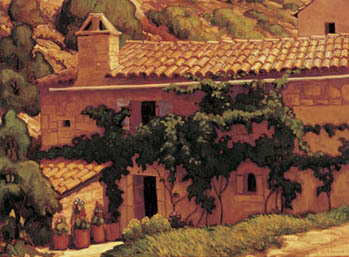 In addition there are special pages dedicated to adobe and stone buildings. The cost of the posters ranges from about $10 to $100, and they are available either as single sheets, matted or framed.